I started with a black creme base (this one is from Urban Outfitters). Then I applied NYX Enchanted Forest over it. I was actually really impressed with Enchanted Forest, as I didn't have to dig around for big glitter pieces and it applied really beautifully. Then I topcoated with Seche Vite. Then I mattified it all, using Hard Candy Matte-ly In Love. One thing worth noting about Enchanted Forest is that I think there are two versions of it. 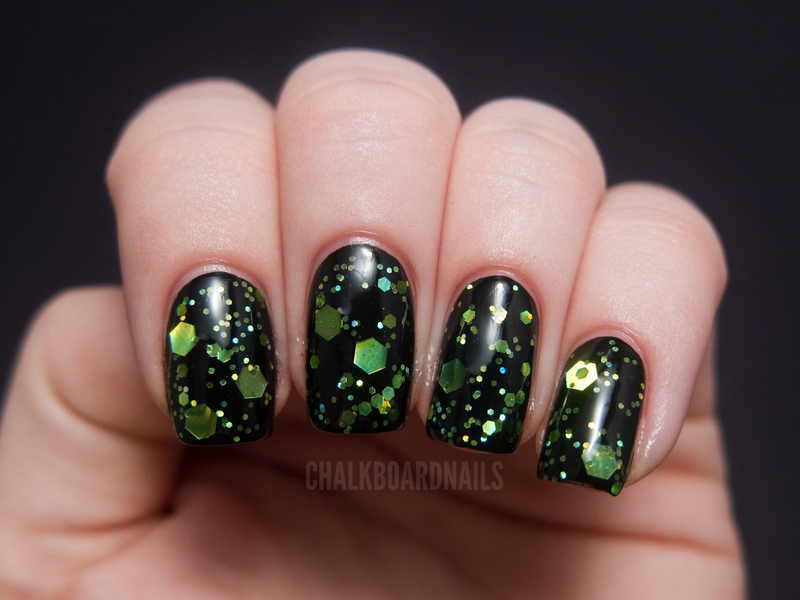 If you Google NYX Enchanted Forest, there is a more full coverage, finer glitter in addition to this one. I'm not totally sure what happened. It's been suggested to me that there is a NYX Girls version and a NYX Salon Formula version. If that's true, this is the NYX Girls version. I wanted to mention it because, if you are interested in buying this, you need to be careful and make sure you are getting the right version! I'd check the picture or something -- make sure it's the version with big chunky green holographic glitter. You can buy this at Cherry Culture for $1.99! This is gorgeous, I love it matted! mmm I love matte top coats! :) Looks great! This is gorgeous!!!! I especially love the matted version. It's sort of halloween-ish, I can see myself wearing it around October =) Love it! I love this polish!! and The Matte finish! Where can I get that? Hard Candy Matte-ly in Love is available at Wal Mart! You can also try Essie Matte About You which is sold at Walgreens, I think. Gorgeous! I love both versions! This is SUCH cool glitter! Love it! Green glitter is the shiz. 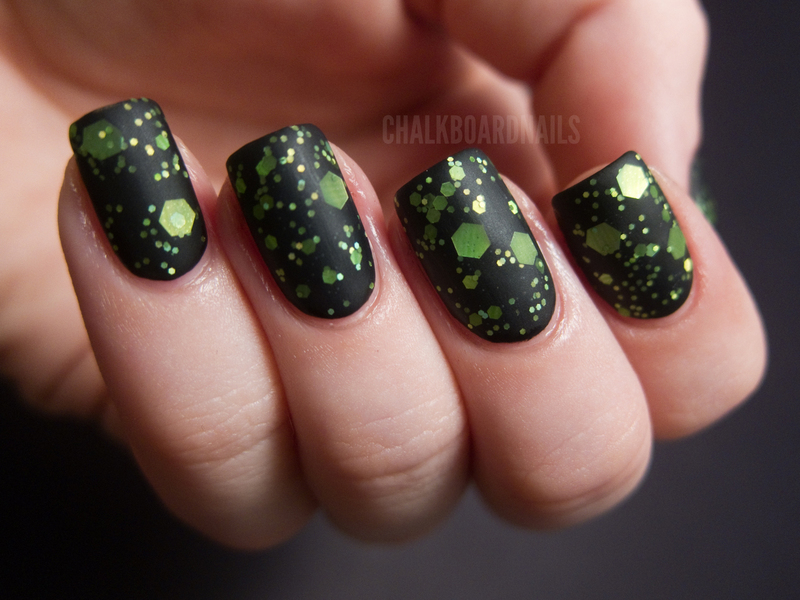 Yes, this is the Nyx Girls version of their polish - I have it and love it myself! Love this, looks like brands are catching on to the Indie trend..big hexies! This is so gorgeous! Definitely going to get this one now! This is the best combination I've seen in a while. I'd been off my polish game and this just inspired me! i love how everythoing looks with matte polish! 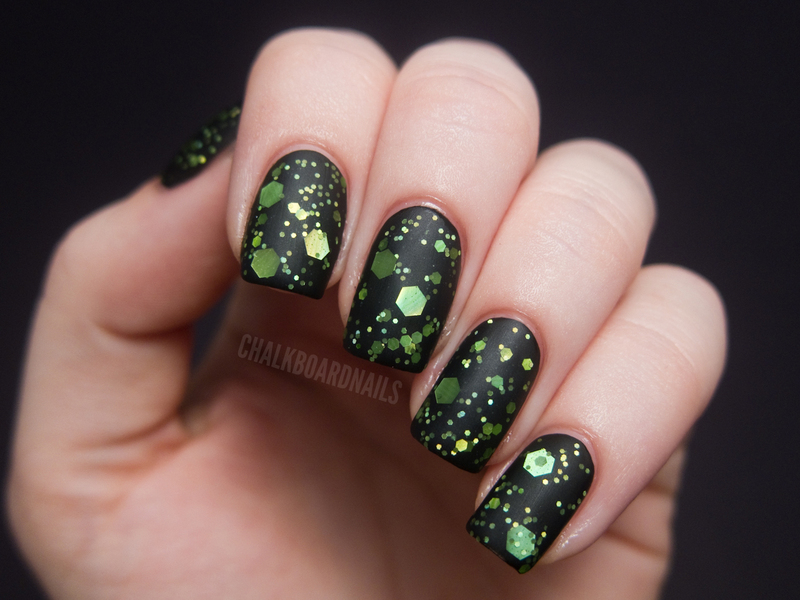 Those gorgeous greens over the black makes me think tech-y and I love it!! Wow! This black is amazing. 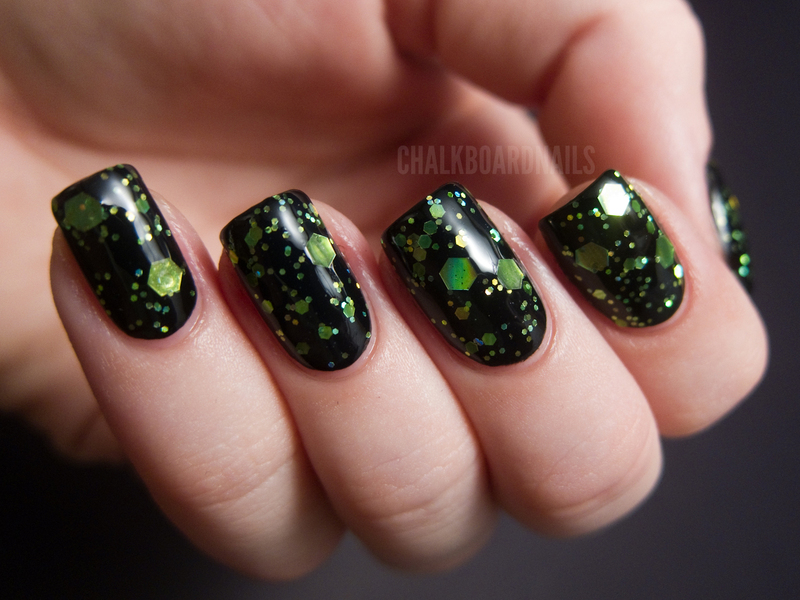 love that green glitters on it. It's gorgeous... I have Enchanted Forest and tried this combination too... Just that my nails are really short xD But it's an amazing nail polish! LOVE Enchanted Forest. So pretty.